Adonis Stevenson - Fighter Of The Year for 2013? 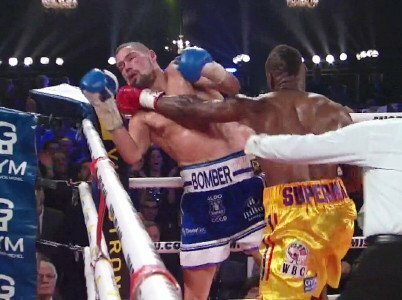 Adonis Stevenson – Fighter Of The Year for 2013? Even though there is exactly one month left in 2013, I think tonight is the right time to give serious consideration to the person who should be recognized as the fighter of the year for 2013. I’ll give you a clue about the person I have in mind for 2013’s Fighter Of The Year – he just knocked out the #1 contender in the light-heavyweight division, Tony Bellew. Tonight’s boxing main event on American premium cable and satellite television network, HBO, [or last night, depending on what time zone in which you viewed the fight] showcased the prime candidate for the 2013 Fighter Of The Year. Poor Tony Bellew didn’t know what hit him. Was it a bird? Was it a plane? No – it was Adonis ‘Superman’ Stevenson, the World Boxing Council (WBC), Ring Magazine and universally recognized Light-heavyweight Champion. Tony Bellew won a world title-eliminator earlier this year to become Adonis Stevenson’s mandatory challenger. Adonis Stevenson’s list of accomplishments for 2013 have exceeded most boxing fans’ expectations, but his old trainer and mentor, the late boxing analyst and boxing dignitary, Emanuel Steward, predicted Adonis Stevenson’s success at light-heavyweight. Just take a moment to consider what Adonis has accomplished in 2013. He started off the year with a rematch, knocking out the fighter who gave him his only professional loss, Darnell Boone. Darnell Boone is a hard-puncher who has given 3 undefeated prospects their first losses and he also knocked down and hurt the elite fighter, Andre Ward, years ago and Darnell Boone was the first person to make it to the final bell against the current WBO light-heavyweight beltholder and power-puncher, Sergey Kovalev (before he was the WBO champion). Adonis Stevenson had already worked his way up to the position of the next mandatory challenger for Carl Froch’s International Boxing Federation (IBF) 168-pound/Super MiddleWeight title. Adonis Stevenson risked losing a world-title fight with Carl Froch by taking a rematch with Darnell Boone. Then, for his next fight, Adonis Stevenson decided not to wait for the world-title fight with Carl Froch to be scheduled – he accepted a fight at a higher weight class with Chad Dawson, who is younger and bigger than Carl Froch. Adonis was supposed to be what is commonly referred to as a ‘tune-up’ fight for Chad Dawson, because he was moving up from a lower weight class, he was at a serious disadvantage in experience, since he started boxing as an adult instead of in his childhood, like most professional boxers, and he had no experience on a world-championship level. Adonis knocked out Chad in the first round of their fight, winning the WBC and Ring Magazine world titles, and became the internationally recognized light-heavyweight champion, rather than just one of the 4 major beltholders of the division. Emanuel Steward advised Stevenson to take a fight with Chad Dawson if he was ever offered that fight and predicted a knockout win for Stevenson. Chad Dawson was coming off of a loss at SuperMiddleWeight when he fought Adonis, but the Dawson/Stevenson fight was being contested at Chad’s best weight, so Adonis Stevenson deserves credit for defying the oddsmakers and the majority of boxing fans and journalists when he won the fight. Emanuel Steward gave Adonis Stevenson the same advice about a potential fight with the IBF Light-Heavyweight champion Tavoris Cloud, with the same prediction of a knockout or TKO for Adonis. Adonis was offered that fight for his first title defense and Emanuel Steward’s prediction for the fight’s outcome was correct again. Tavoris Cloud was no longer the IBF champion when he fought Adonis Stevenson, but the win for Adonis was impressive because he won every round of the fight with superior boxing skills, in addition to his power-punching, and Adonis became the first person to ‘stop’ Tavoris Cloud by knockout or TKO. Adonis Stevenson’s work ethic and attitude are unusual for this era of boxing, since he fought his mandatory challenger, Tony Bellew, approximately 2 and a half months after his fight with Tavoris Cloud, rather than letting the year end without fighting his mandatory challenger and vacating his WBC belt or being stripped of it by the sanctioning body, and took a high-risk, low-reward rematch with Darnell Boone, so that he could restore his confidence to the appropriate level and be at peace with himself. Just like the Boxing Writer’s Association of America (BWAA) Fighter Of The Year for 2012, Nonito Donaire fought 4 times in that year, Adonis Stevenson has fought 4 times in 2013 – a streak of 4 consecutive knockouts. Adonis Stevenson is a convicted felon who paid his debt to society and then discovered the profession of boxing as an adult and used it to straighten out his life by making an honest living with it, just like another current light-heavyweight titleholder, Bernard Hopkins. For all of these reasons, Adonis Stevenson is my fighter of the year for 2013. What do you think? I want to finish this article with a reminder to Magomed Abdusalamov’s family and friends – Magomed is still in our thoughts and we want him to get well soon and we appreciate the great effort and great fight he gave us a few weeks ago. You are here: Home / Boxing News / Adonis Stevenson – Fighter Of The Year for 2013?